You may monogram with 1 initial or 3 initials. Monograms with 3 intials will be painted in a typical monogram style with the 2nd letter larger than the 1st and 3rd letter. Please request the monogram letters in the exact order you want them to appear - typically first initial, last initial, middle initial - so Amy Jo Wilson would be requested as AWJ. Please feel free to type additional requests in the personalization box. Full Description You may monogram with 1 initial or 3 initials. Monograms with 3 intials will be painted in a typical monogram style with the 2nd letter larger than the 1st and 3rd letter. 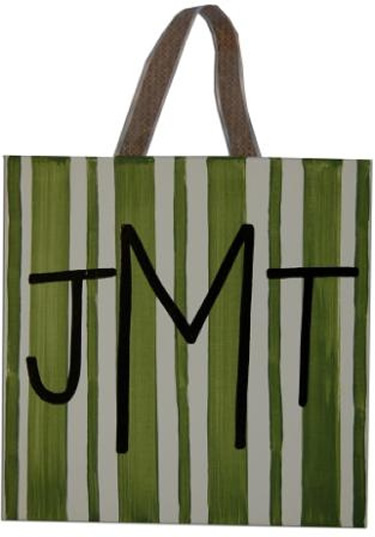 Please request the monogram letters in the exact order you want them to appear - typically first initial, last initial, middle initial - so Amy Jo Wilson would be requested as AWJ. Please feel free to type additional requests in the personalization box.